Whether you’re hosting an intimate dinner with friends, cocktail reception, rehearsal dinner, baby shower or a happy hour for your team, 27 Restaurant & Bar provides with a variety of unique spaces tailored to your needs. 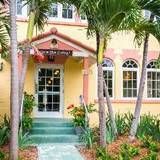 Located in a historic house adjacent to the courtyard, 27 Restaurant is Freehand Miami’s first full service restaurant and bar. With a focus on a welcoming communal dining atmosphere and the creative spirit of a modern-day salon, 27 Restaurant in Miami Beach utilizes the freshest local ingredients and highest-quality produce available, including fresh fish, shellfish, choice meats, and local produce – much of it grown on the property’s onsite garden. The menu pays homage to the diversity of Miami and its melting pot of flavors and cultures. Escape to our backyard oasis, Broken Shaker and revel in the Tales of Cocktail’s award-winning Best American Hotel Bar. Please fill in your information below and Jessica Chasin will contact you as soon as possible to book your event. If you’d prefer to talk now, please call us at (844) 566-8426.